It’s rare a band comes to the stage of releasing their seventh album and still has the world eager to hear what it will sound like. By now artists have usually laid their cards on the table for all to see, genres explored and boundaries well and truly pushed. And whilst this is certainly true of Muse, the stadium-sized trio still has the eyes (and ears) of the music world upon them. Their new record is entitled Drones, the title confirming that the string of eccentric themes running through their releases is set to continue. So what is it about Drones that worries Matt Bellamy and co enough to warrant an album? “To me, ‘Drones’ are metaphorical psychopaths which enable psychopathic behaviour with no recourse. 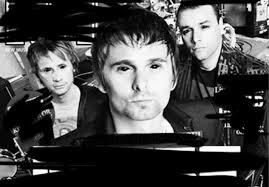 The world is run by Drones utilising Drones to turn us all into Drones.” Bellamy wrote on the Muse website. “They’re a modern metaphor for what it is to lose empathy.” He continued, in an interview with Annie Mac. “The next step in drones is gonna be autonomous drones, which actually make ‘kill’ decisions themselves, where no humans are involved,” Bellamy added. OK…so when he explains things that way, I suppose Drones as a theme stands up next to the 2nd law of thermodynamics and the impending end of the world. The good news is, when Muse get carried away with these doomsday thoughts, the good music soon follows. The band have unveiled three songs from the new album so far, the riff led rocker Psycho, the industrial techno number Dead Inside and a track they’ve been playing during their latest UK tour Reapers. They’re some of the strongest tracks the trio has released since 2006’s Black Holes & Revelations. Although they sound perfectly fine on their own, Drones is very much a concept record, designed to be listened to whole. Exciting stuff! Roll on June 8th when the Drones will arrive.